I couldn't resist doing another Black and White card using Fresh Cuts - I love the simplicity yet elegant look of black and white. 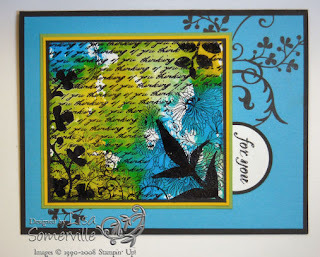 ...For this card I used the SCS SC181 and the Faux Diamonds Technique. Don't forget you can order your Fresh Cuts Stamps and Note cards until June 30th. Directions for my Fresh Cuts Cards and Note Box Class are available when your order your products by June 30th. Click here for details.